I was very proud to have participated on this film, taking many of the still images. 2018. 83 m. Paula Eiselt. Abramorama/Film Collaborative/Tamar Simon. US. English. Rated NR. Set in Borough Park, Brooklyn, 93Queen follows a group of tenacious religious women—including the one-of-a-kind Rachel “Ruchie” Freier, a no-nonsense lawyer and mother of six—who shakes up the Hasidic “boys club” by creating Ezras Nashim, the first all-female ambulance corps in New York City. Part of what motivates them is that strict prohibitions on contact between the sexes prevent some ultra-Orthodox women from calling for medical help when it’s needed. Director Paula Eiselt’s unprecedented insider access creates a unique and inspiring portrait of a group of observant women who take matters into their own hands to change their community for the better from within. An entertaining, feel-good documentary about women taking care of women. i’m honored to have two images that have not been previously in any other show.. 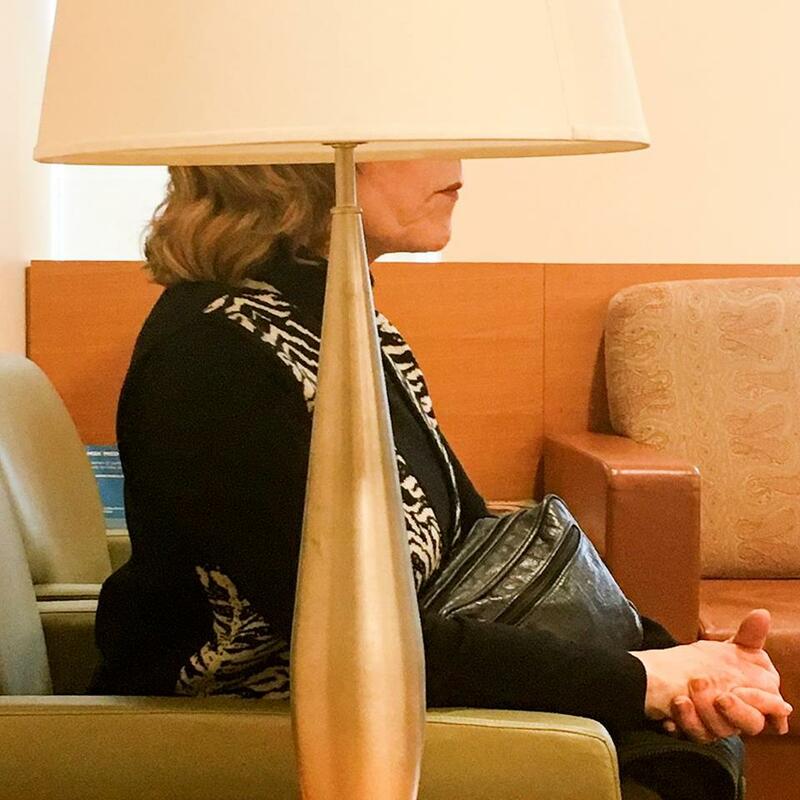 The Waiting Room was selected by Juror Steve Diamant and will be included in the upcoming Contemporary Portrait exhibition at The Southeast Center for Photography, in Greenville , SC, Michael Pannier, Director. Steve Diamant is the Founder and President of Arcadia Contemporary and sits on the board of the Fine Art Dealers Association (FADA). An exhibition of photographs by outstanding artists across the US that serves as an important statement of our determination and power to fight for justice for ourselves, and all people, in all our differences. The exhibit will bring together photographs from the Women’s March, January 21, 2017, and other recent events in the United States, including Black Lives Matter, Standing Rock Movement and March for Our Lives. Ellen Feldman is a long-time street photographer, photo-artist, and book maker; her work has appeared in many solo and group exhibits. She is Photography Editor of Women’s Review of Books and holds a Ph.D. in Cinema Studies from NYU. Marky Kauffmann has been working as a fine art photographer, educator, and curator for over thirty years, including curating “Outspoken: Seven Women Photographers,” currently touring schools and colleges throughout the Northeast. She is the recipient of numerous awards, including a Massachusetts Cultural Council Artist Fellowship in Photography. I’m gratified to know that i have been selected as on of the Gold Medal winner in the San Francisco Bay International Photo Festival . My image will be exhibited with 32 others at the ACCI Gallery, in Berkeley, California, during the San Francisco Bay Month of Photography in September of 2018. The opening is September 7th. Communication becomes stifled when the topic is sorrow. Gestures shift while contemplating mortality. Rituals are performed while the sky continues on despite us. Fifteen visual artists will show together and address aspects of navigating loss, foregoing the notion that grief is something better hidden away. "I Surrender, Dear" curated by Frances Jakubek, opens July 10th at Umbrella Arts Gallery, 317 E. 9th St., New York; through August 4th, 2018 with a reception on Tuesday, July 10th, from 6-8pm with the artists. Portraiture emerged as one of the most prominent genres of depictive media early in the history of the visual arts; tacit or explicit rules, conventions and cultural expectations have always influenced the ways in which artists approached the genre. Photography is no exception. Numerous different and characteristic styles of portraiture emerged throughout the history of the medium. We usually assume that faces are necessary components of portraiture; we may, however, learn just as much about the character, the personality of a person by looking at images that depict other parts of their bodies, show us the objects or places associated with them. Not focusing on the face may open up a new dimension of interpretation. Our Portraits Without Faces exhibition is dedicated to this challenging divergence from the more conventional approaches to the genre. Quién? Qué? Dónde?” means “Who? What? Where?” in Spanish. Spanish is one of the worlds’ most commonly spoken languages and is often chosen as the second language one learns. The name was chosen for this portrait exhibition in order to underscore the complexities of all of our diverse roots. A portrait photograph can inspire many questions and if we look hard and long enough, the answers as well. Please join us to the beginning of the glorious Spring and Summer Season with the opening of the upcoming American Splendour : New Photography group exhibtion! Juried by Hannah Frasier, Jon Feinstein, David Rosenberg, Loni Efron and Ruben Natal-San Miguel. Annie Leibovitz, Ken Regan, Elliot Ross, Mark Seliger, Rachel Papo, Todd Hido and Oliver Wasow. This exhibit is dedicated in Memory of Ruth Bernhard and her Creative Spirit. Christa Blackwood is an acclaimed photo-based artist whose photographs of male nudes reference identity, photographic/art history and popular culture. Her works employ multiple techniques and methods fusing traditional, historical and alternative methods with contemporary ideas and practices. She has been featured in The New York Times, Art Desk Magazine, The Village Voice and The Chicago Sun Times and her work has been exhibited in galleries and museums throughout the U.S. and abroad. Thank you The Curated Fridge,Yorgos Efthymiadis and J.Sybylla Smith for including me in the next iteration for the winter show. The latest refridgecurator, for the Winter 2018 Show, is J.Sybylla Smithindependent curator, teacher and consultant! Part artist, part academic, J. Sybylla Smith is equally compelled to create art as to examine its cultural significance. Her collaborations have led to lasting relationships with renowned galleries, museums, art fairs, advertising agencies, and international print publications. Smith’s current practice focuses on developing creative content for individual clients and organizations as a curator, portfolio reviewer/creator, editor, brand developer, educator and speaker. i hope it’s a good showing for all! Thanks to A Smith Gallery for including me in their “Summertime” exhibition. PH21 Contemporary Photography GalleryH-1092 Budapest, Ráday u. 55. Karen Marks has been Director of Howard Greenberg Gallery for over 15 years. In that time she has organized countless exhibitions, curated international art fairs and edited many publications. She is also an active board member of Association of International Photography Art Dealers. Karen Marks has been working in the world of fine art photography since her graduation from the School of Visual Arts in 1984. Starting as a junior specialist in the photography department at Swann Galleries, since then she has worked in both public and private galleries, advising private clients and working closely with public institutions. She has juried numerous competitions and is called upon frequently as a portfolio reviewer for many programs. Photographer Amy Arbus has published five books, including the award winning On the Street 1980-1990 and The Inconvenience of Being Born. The New Yorker called The Fourth Wall her masterpiece. Her most recent, After Images, is homage to modernism’s most iconic avant-garde paintings. Her advertising clients include Chiat/Day, Foote, Cone and Belding, American Express, Saatchi & Saatchi, SpotCo, New Line Cinema and Nickelodeon. Her photographs have appeared in over one hundred periodicals around the world, including New York Magazine, People, Aperture and The New York Times Magazine. She teaches portraiture at the International Center of Photography, NORDphotography, Anderson Ranch and The Fine Arts Work Center. Amy Arbus is represented by The Schoolhouse Gallery in Massachusetts. She has had twenty-five solo exhibitions worldwide, and her photographs are a part of the collection of The National Theater in Norway, The New York Public Library and The Museum of Modern Art in New York.